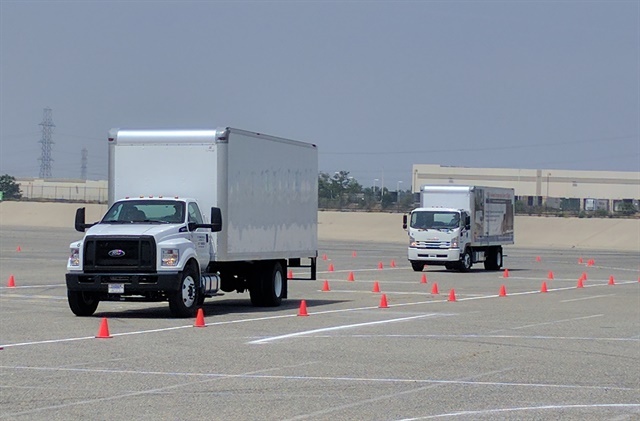 The driving event included closed-track test drives of the redesigned Isuzu 2018 FTR against competitive trucks – Kenworth K270, Navistar 4300, Hino 268A, Freightliner M2, and Ford F-650. The 2018 Isuzu FTR, rated at 25,950 lbs. GVWR, is available in one powerplant configuration, a 5.2L four-cylinder engine with an Allison six-speed transmission. The FTR is rated at 215 standard horsepower and 520 lbs-ft. standard torque. Of the six vehicles, the FTR placed third and fourth in acceleration tests of varying miles-per-hour limits. 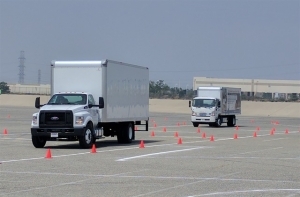 In two braking tests, the FTR placed fourth and tied for third place. The FTR placed first in turning radius. Measuring fuel economy, the FTR won first place in both the mountain and city routes. In the city route, the FTR beat the next competitor by 16.1% and 22.3% over the last place finisher. Production of the 2018 Isuzu FTR began May 8th at Isuzu’s Charlotte, Michigan, plant. Isuzu expects to ship orders in mid-June. Read the full Heavy Duty Trucking article.